DL-109FT braces have been proven in lab tests to support up to 75,000 lbs. Note: DL-109FT braces are only to be used in PAIRS. Overall Height . . . . . . . . . . . . . . . . . . . 35 in. Overall Width . . . . . . . . . . . . . . . . . . 9.75 in. Overall Length. . . . . . . . . . . . . . . . . . . 24 in. Weight (individually). . . . . . . . . . . . . 150 lbs. Maximum Capacity (Pairs) . . . . . . 75,000 lbs. The DL-109FT steel braces are strictly intended to be used as a pair. 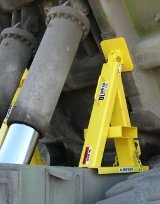 DL-109FT’s are a safe, efficient, and effective product to secure dump beds on large off-road and quarry dump trucks. DL-109FT braces can safely hold beds at higher angles than manufacturer props which allows safe access to a wider area underneath the dump bed for maintenance and servicing. DL-109FT’s are easily installed and stored. DL-109FT’s can be used universally on any brand of dump box. DL-109FT’s can save your company or municipality money by preventing accidents, thus lowering your insurance rates and protecting your employees and their families from workplace tragedies. 1. Set the parking brake and raise the bed. Use a forklift to set the DL-109FT on frame rail and position so that the DL-109FT makes contact with both the bed and the frame. 2. 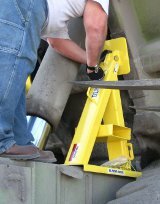 Place safety chain around cross member on frame and pull through the chain taut through the securing slot on the DL-109FT. 3. Carefully lower bed onto the DL-109FT.